Description:Used 2006 Arctic F5 Sno Pro for sale - $2,500.00 with 3,984 miles. 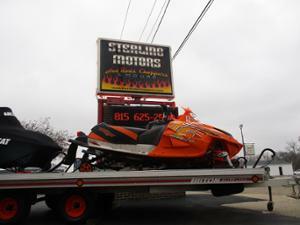 2006 Arctic F5 Sno Pro You have found what is considered to be one of the best 500cc sleds on the market. The F5 is lightweight weighing in at 447 lbs. and has great torque making it an incredible trail sled with its upgraded Fox Float shocks all the way around. Not only that but the 2007 model was switched to EFI which resulted in a 20% decrease in power making the 2006 considerably more desirable. This particular example was optioned in orange and currently has 3,984 miles. It has been upgraded with extended risers, Pro Maxx hand guards, an orange Cobra windshield and an all-weather cover suitable for trailering. The track was replaced about 1,000 miles ago, the drive belt and the spare are less than 2 years old and everything works perfectly! We have priced this sweet F5 aggressively so if you like what you see you better get a hold of us before someone else does!